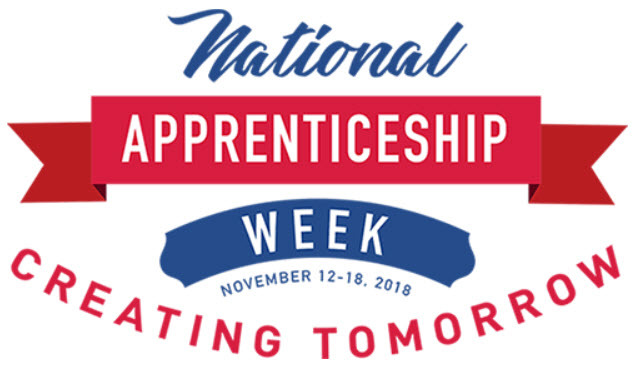 Across the nation, thousands of individuals are celebrating National Apprenticeship Week, which runs November 12th through the 18th. This week is dedicated to recognizing those individuals who have decided to join the skilled trade industry by becoming an Apprentice. There are over 1,000 occupations utilizing an apprenticeship program in the world today, ranging from manufacturing to healthcare. The concept of apprentices has been around for thousands of years, in which guilds would take on trainees and instruct them the art of the trade in exchange for food, room and board. Throughout the past 200 years, the interest in apprenticeship programs waxed and waned. During the Industrial Revolution, apprentice programs flourished with the development of trade unions, though fell out of favor in the late 20th century due to the amount of time it took to become an apprentice. Recently, the programs have been revamped to include accelerated programs and other in demand fields, such as Information Technology. “Registered Apprenticeship is a tried-and-true approach for preparing workers for jobs – and meeting the business needs for a highly-skilled workforce that continues to innovate and adapt to meet the needs of the 21st century. [Apprentices] reduce worker turnover by fostering greater employee loyalty, increasing productivity, and improving the bottom line.” These programs are not only beneficial for the employer, but the apprentice as well. Many apprentices utilize the program as a way to jump start their career, as from the very beginning of the program, the apprentice will be earning a paycheck as their training progresses. This paycheck will increase throughout their training as they successfully pass various competencies. PVS Structures, a division of Owen Industries, is proud to provide opportunities in the Welding field with our Welder Apprentice Program. The Welder Apprentice program at PVS Structures is the only US Competency based apprenticeship, in which the apprentices learn and earn as they progress through the various competencies. Once the competencies have been mastered, typically at the end of the two years, the apprentice will receive a certificate from the Department of Labor stating that they are now a Journeyman. Owen Industries developed this program knowing that in the next six years there will be a significant shortage of Welders. “By 2025, the industry will suffer a shortage of 400,000 welders” (American Welder Society). Recently Owen Industries celebrated their first apprentices graduating from the Program. Thomas Stalbosky and Brad Dittman completed the program and received their Journeyman Certificate in October 2018. “There are a lot of people who can’t afford to pay for schooling and a full-time job to keep living,” Stalbosky said. “Then you have places like this that offer a full-time job and pay for the schooling” (Stewart, 2018). “They’re going to make sure you’re prepared,” Dittman said (Stewart, 2018). Chris Haslinger, a member of the United Association of Journeymen and Apprentices stated that, “as apprentices become journeyworkers, they take pride in the hard work they’ve put in, and they understand the importance of passing the knowledge and skills they’ve developed on to the next generation of apprentices that come behind them. That’s what Registered Apprenticeship is all about” (Quick Start).